Its was a evening of truth football spirit and reconciliation by the top Tafea players; Francois Sakama, Robert Thomas, Jeffery Gete, Freddy Vava and Jean Nako Naprapol to all football fans in Vanuatu. The Political advisor to the ministry of Youth and Sport Mr Marcel Manua was present at the reconciliation meeting with VFF Vice President Saby Natonga and Treasurer Albert Manaroto. Tafea FC team manager Steve Felix speak on behalf of the players that they are very sorry for not playing for Vanuatu in the Pacific Games and ask for VFF, Goverment and Supports to forgive them. ” We want to come back and play for you all and hope we can work as a team to give you all the best resutl you all want in the future.” said the Tafea players. This is a great steps towards rebuilding the image and morale of Vanuatu Football, as the Ministry of Youth and Sport and Vanuatu Football accept the apology from the five Tafea players. “You are all very important players of Vanuatu football and we want to see you in the field of play to play for Vanuatu , so please come back and play for your flag which is the best thing to do for your people in Vanuatu,” said Marcel Manua. 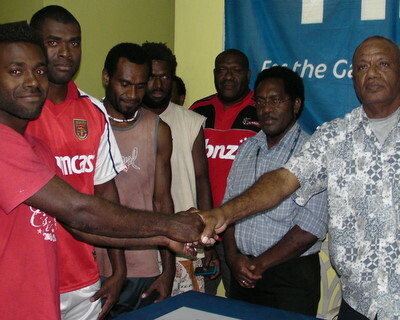 The reconciliation ceremony end with a small refreshment at Vanuatu Football House.